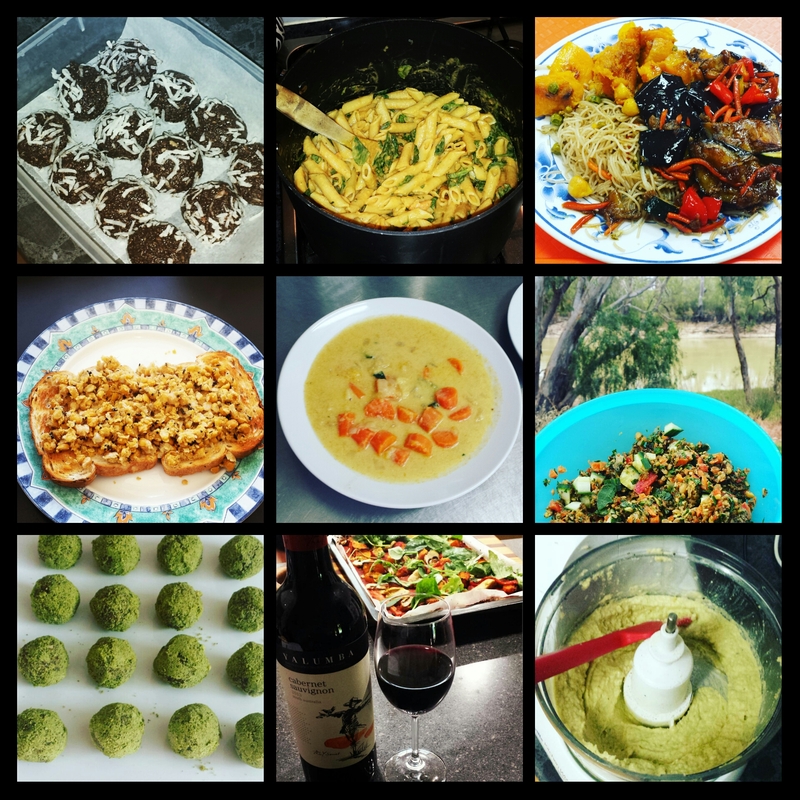 Veganuary – the story so far! After 2 years of trying to eat plant-based MOST of the time (I estimate 85-90%) I decided to take the challenge to eat vegan for the entire month of January. As I write there is a week to go, and I can see one major challenge to come, but I thought this week I would write about some of the things I’ve learned so far. 1) Trying to eat vegan on the road is REALLY HARD unless you take your own food. Truck stops are not noted for their vegan options. Muesli bars and nuts are good portable road snacks. Fruit too, although you have to make sure you eat it all before you enter South Australia! 2) I sort of already knew this but wine and cider is not necessarily safe (in fact, more likely non-vegan than vegan). There is a very useful website called Barnivore which lists alcoholic beverages by veganosity. (I’m not certain ‘veganosity’ is an actual word but it’s a good one. ‘Veganity’ would also work). I now know a few ciders that I can safely drink – sadly not my absolute favourite but a couple that are readily available in Adelaide. I did manage to find a lovely vegan wine in Thredbo – naturally a South Australian one! 3) Balls are fantastic. I’m talking vegan energy balls. Quick to make, healthy (most of the ones I have made contain sugar only in the form of dates), portable and delicious. Dates are expensive though. It’s hard to find a cheap date! 4) Eating vegan at home is easy (I already knew that). Eating at other people’s places is a bit difficult – although my mum has catered to me admirably with a little help from the fantastic website One Green Planet (which is also the source of much of my inspiration) – follow them on Facebook and/or Instagram and prepare to have your mind blown! Eating with a group of people in a self-catering arrangement where you are the ‘only vegan in the village’ requires a bit of flexibility and creativity. And a couple of standbys such as canned chickpeas and peanut butter never go astray! 6) You can pretty much make any omni dish you want into a vegan one. It might take more time and require some ingredients you can’t find in a supermarket, but it can be done if you want it badly enough! You can even get a vegan fried egg – not that I could imagine any vegan would want to eat anything that looks like (and presumably tastes like) a fried egg! 7) Forget about trying to get a vegan meal at a sporting event. Hot chips might be OK depending on what they’re cooked in, and if they’re cooked in the same vat as chicken nuggets etc. Plain crisps on the other hand, are generally safe (at least it’s easy to tell by reading the packet) but crisps do not a meal make. 8) As a rule you will tend to eat healthier – as you won’t go near most fast food, Bunnings BBQs and late night yiros/kebab joints. And it’s easier to control yourself at morning/afternoon teas at work if most of the delicious looking foods on the table are on the ‘no go’ list! Don’t be fooled into thinking that ‘vegan = healthy’ though. My current favourite raw vegan chocolate tart is loaded with calories and sugar. But no animals were harmed in the making of it, so I will happily eat it in moderation. My next big challenge will be the 100km track championships this coming Saturday night. An overnight race – I will certainly be requiring some food but I’m not yet sure what, how much, and when. If I can get through that on a vegan diet, I’m pretty sure I can get through anything! I guess you’ll be hearing all about THAT next week! Well done, keep it going! I started veganism about 9 months, just for a month but then just kept going… hopefully uou will too!